This 3D Photo Cube is the ultimate personalized gift! Create your own special keepsake with this 3D Personalized Photo Crystal. Choose from 2 different sizes which will accommodate from 1 to 3 people. Just email your favorite photo and we will do the rest.. 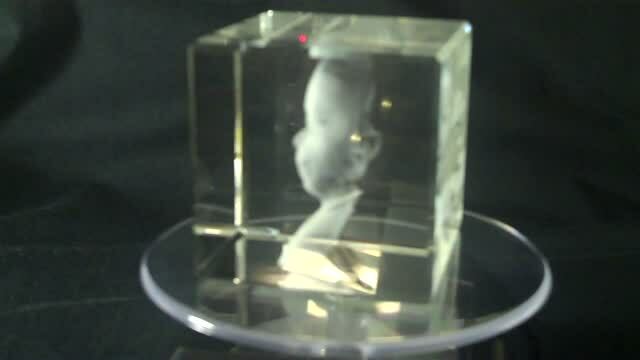 Your photo will be etched into the crystal in a unique 3D effect, the person or object will appear to be inside the crystal! Ideal for any event in your life that needs to be remembered with a smile. Choose to add on one or two lines of engraved text, or enhance your crystal with a lighted base. The final quality of a personalized photo item depends on the original photo you provide us. The general rule is the better the quality of the photo the better quality engraving or printing it will provide for. Well lit, high resolution photos provide the best results. It is not necessary to upload pre-cropped pictures. Our professional staff of artists will crop the pictures according to the shape and edges of the item you order. We don't include any backgrounds on 3D crystals. However, if people are sitting on grass, the floor or a chair, we may include those objects. For a personalized item, you have the option of engraving words along with your photo. We have a character limit including spaces since longer text might interfere with the images. The character limit will depend on the size of crystal chosen. Don't worry, if we are concerned that there are too many words, we will contact you.